We’ve mentioned this before but it’s worth repeating: We love our athletes’ feedback and we take it to heart. That’s why we’re excited to announce the immediate availability of the following user-requested updates to our mobile app. To access these new features, simply update the app on your mobile phone. We know you like to plan your week. Whether for setting your schedule, preparing your training notebook, or getting your mind right, seeing your programming in advance helps you get ready. Until now, you’ve only been able to preview your coming workouts on our website. This required a few steps, including leaving the mobile app. You also couldn’t see your coming week until Monday. This made it difficult to plan over the weekend for the week to come. We have added the ability to preview your coming workouts from within the mobile app itself. And you can see next week’s workouts up to one week in advance. This is the main view from which you will preview, select, and start your workouts. You’ll notice we’ve added numbered tabs to reflect each training day in your program. You may tap on any numbered day to reveal the corresponding workout. By default, your Training Plan view presents an overview of each exercise with the number of sets and the top intensity (%). If you tap any exercise overview, you will reveal the full set, rep, and intensity scheme for that exercise. To return to the exercise overview, just tap the exercise card again. You can preview up to two full weeks of workouts in the Training Plan view. Thus you can view all your workouts for the Current Week, and you can see Next Week's workouts as well. This will help you plan next week without having to wait until each Monday. Both preview weeks will advance forward by one week every Monday. Though you can’t yet pause this weekly rollover, we are working to let you do so (see What's coming? below). 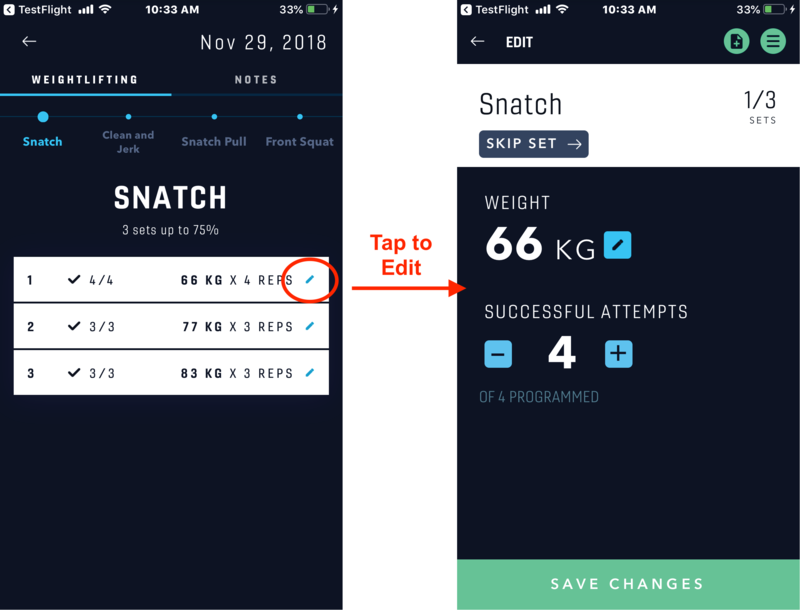 We know how much it helps to keep an accurate record of what you actually lifted. 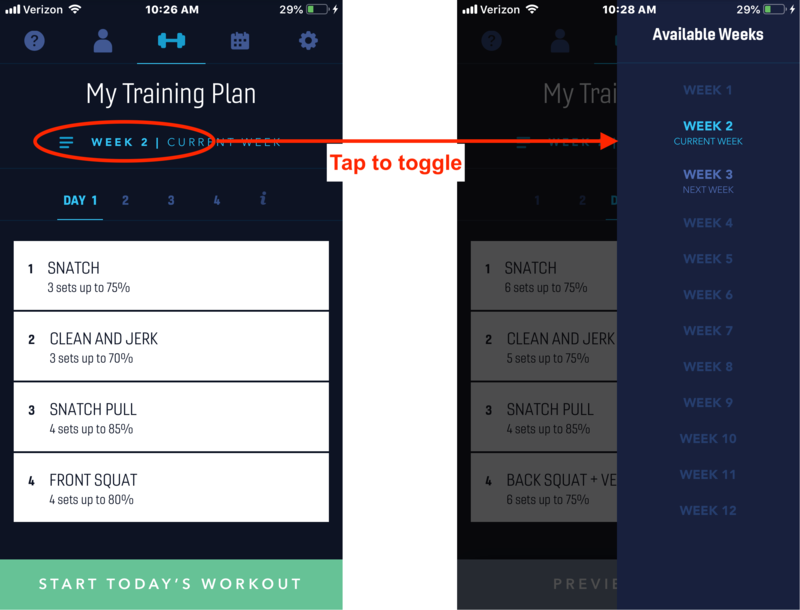 That’s why today’s feature update includes the ability to edit your workout history. These will make it easy for you to go back and make your own corrections, as many of you have requested. PAUSE TRAINING. We get it...sometimes life gets in the way of training. Going on a vacation? Nursing an injury? Work getting in the way? Whatever the reason, you will soon have the ability to “pause” your training cycle so you can pick up where you left off. SKIP ENTIRE WORKOUTS. You’ve told us that sometimes you are unable to complete all your workouts during a given training week. 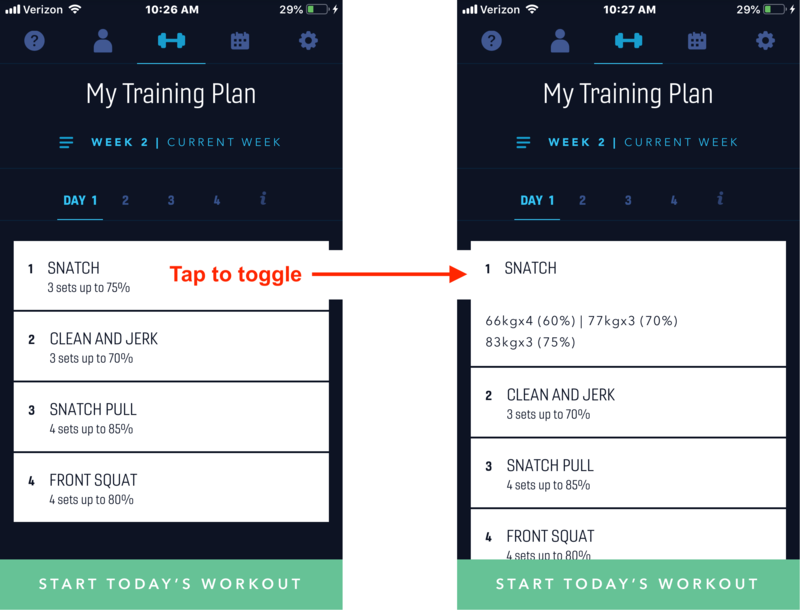 Soon you will have the option to skip an entire workout. For example, if you have 4 training days programmed but can only devote the time for 3 workouts, you will have the flexibility to decide which one to skip! FINISH INCOMPLETE WORKOUTS. You’ve asked us to keep all your incomplete workouts available for completion, rather than locking them down once they are in your history. Soon you will be able to complete unfinished workouts at your pace and whenever you want. We are excited about the future, and we can’t wait to share more details with you as we proceed.